Burgeoning Wolverine Star: The speed option: What went wrong again? Tate has now gotten the call from the sideline and is getting into the snap count. The player to look at here is the playside (bottom of screen) cornerback who is now showing blitz. The linebacker that was lined up over the slot man has now shaded over to the line of scrimmage and is also showing blitz. This ability to hide their play before Tate got the call from the sideline will be key to the play. Here's the snap. Moosman, as was his tendency all day, makes a bad snap that Tate has to work for. Michael Shaw is coming across the formation for the option dive. As mentioned, this is probably not a read yet, but Forcier is still in charge of reading the backside defensive end, who is crashing down on Shaw and coming in unblocked (as designed). This doesn't tell us any more about whether or not Forcier was given the option to hand the ball of to Shaw here because, as you can see, with the DE crashing down on Shaw, the correct read is to pull the ball. However, you can also see the playside cornerback who showed blitz is now also crashing down on the play. I assume that in the future, when this play is more of a factor in the playbook, Matthews (whose corner is crashing on a blitz) will be instructed to turn and look for a quick pass. This is not in the playbook yet. Forcier is still reading the backside DE who is still crashing on Shaw. The playside cornerback is still coming on a blitz but is mostly in charge of keeping contain on the play. Another thing you can see here is that playside middle linebacker has been charged with spying Forcier. 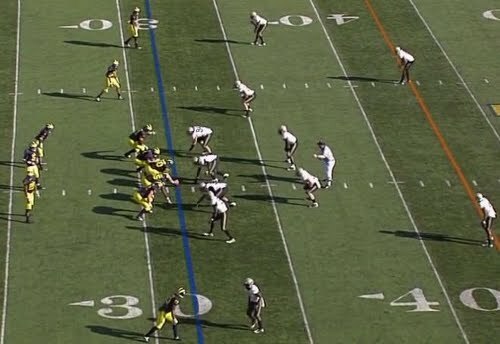 Much like the first play, Purdue played a lot of man/assignment football that, if the coach is good enough and has enough of the playbook open, will eventually crush. Again, Michigan just isn't there yet in their development. Forcier has pulled the ball as he was supposed to do, but the backside DE has made a really good play and already started to turn and attack Forcier. 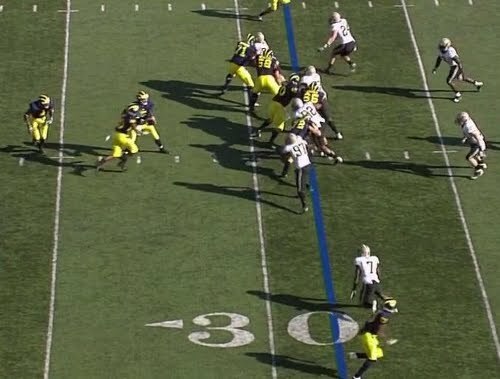 This makes a numbers problem for Michigan. 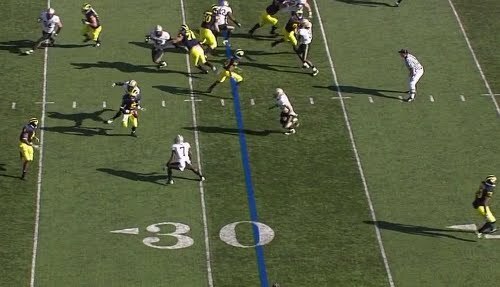 Rather than having 2-vs.-2, which Rodriguez will take any time, Michigan is now going up against 3 defenders with only two players--the DE, corner, and linebacker against Forcier and Minor. Matthews has released past his cornerback and is looking to block on the second level. Matthews may have missed a read here; there's a chance that the play is designed so that if the cornerback blitzes, he's supposed to stay with him and block. This is all speculation and unlikely. 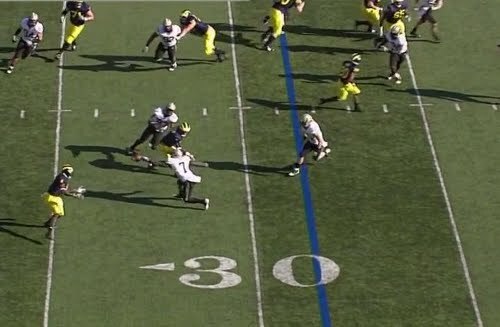 The Purdue cornerback makes a really nice play here and reaches out to swat the ball down. This is the epitome of high-risk/high-reward for Purdue. We know how this play ended, but if the cornerback misses that ball, or Forcier makes a better pitch, this play probably goes to the endzone. 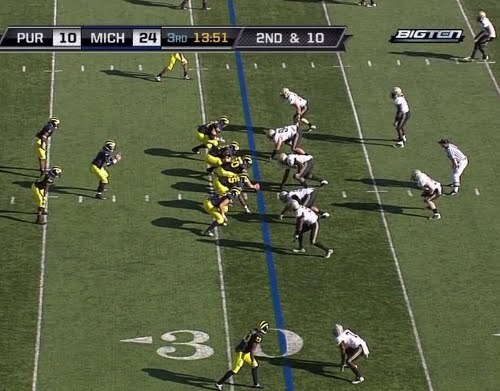 If you remember, Purdue was playing a 4-3 under with two deep safeties. They blitzed their cornerback allowing Matthews to release to the secondary uncovered and looking to block someone (one of the two deep safeties). So if the cornerback misses the swat here, the linebacker isn't fast enough to catch up to Minor, who's about 7 yards away and will likely get the edge of the field. 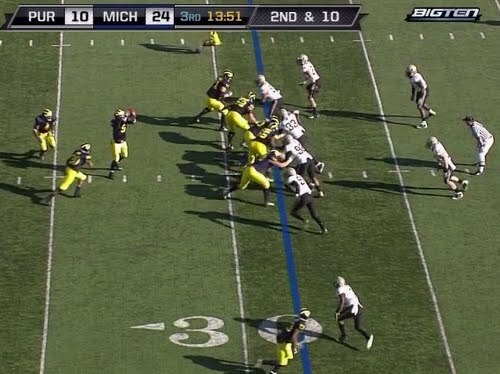 This corner blitz was a really good call by Purdue, but Michigan's alignment on the first triple option play didn't give it away. This is just kind of bad luck and probably a bad play on Forcier's behalf. Bummer.